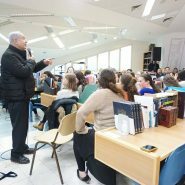 Earlier today, PM Netanyahu paid a visit to the seminary where my oldest daughter, 21-year-old Hadas, is studying for the year. In this video, you can see Hadas challenging her prime minister with such a tough question regarding one of his policies* that it took him an entire 7 minutes to answer it. This video makes me feel so proud. Proud of my daughter, who stood up and spoke truth to power. But just as much, this video makes me feel very proud of Israel. Israel isn’t perfect. If it was, Hadas would have no questions at all to ask Binyamin Netanyahu. But at the same time, there’s no other country in the Middle East where a person could stand up–unafraid– and challenge the prime minister like Hadas did today. And that, I think, should be the source of great nachas for Israelis as well as all Jews around the world. *JewishMOM.com is a politics-free zone, because what connects JewishMOMs is infinitely more important than what divides us. So I’m not going to be sharing Hadas’ question here.